Tarara (representing Indiana University) presents La música en España y el nuevo mundo, a program of sacred and secular repertoire inspired by the Spanish cultural sphere of influence; both domestically and in the new world. Tarara utilizes historical instruments and performance practice to bring this under-performed repertoire to life. Tarara, representing Indiana University, will perform as part of Early Music America’s Young Performers Festival, May 24-26, 2018, as part of the Bloomington Early Music Festival. 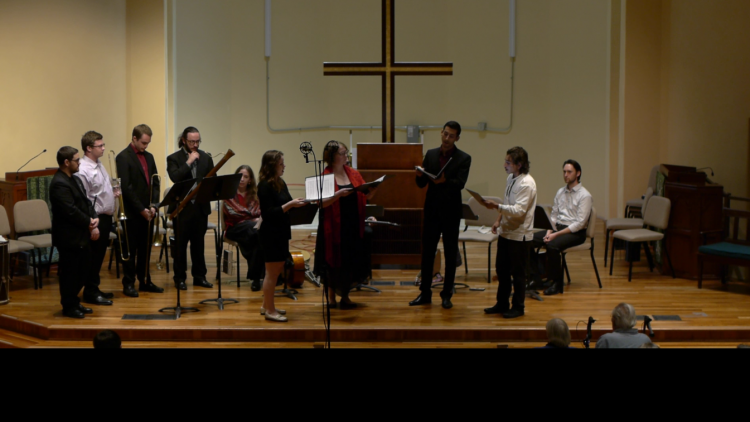 Tarara focuses its performances on programs of sacred and secular music from renaissance Spain and South America. Tarara is made of students and alumni of the Jacobs School of Music at Indiana University. The ensemble regularly includes sackbuts, cornetto, dulcian, recorders, theorbo, renaissance guitars, continuo organ, viola da gamba, and voices. 2018 Young Performers Festival Program: Tarara presents La música en España y el nuevo mundo, a program of sacred and secular repertoire inspired by the Spanish cultural sphere of influence; both domestically and in the New World. Yo sé que no ha de ganar – Anon. Entre dos alamos verdes – Anon. De uno en uno – Anon.